Well, despite the winds the Swishes were great. I have three that can be painted. The 2.3mm Reapers were pretty good too, but probably need weight. Real easy to throw, like the 90% Voyagers. I also tried some of them and I guess as I am smoking chickens tomorrow, I can set up a paint station and paint LDs. The wind did cause some problems. The Swishes and Reapers wanted to fly past me, some very far. I also had trouble throwing into the wind as is normal, and had to go about 45 off the wind. Even so the booms were getting a lot of air and drifting left. I had one Voyager that I was sure hit the ground only to see it land again about 20 yards past touchdown. Quite a bounce. I had another that I saw go into a tree but I was looking into the sun and couldn’t follow it. I saw leaves drop out but no boom. I couldn’t see the boom so I lost it. Who knows, it may be 30 yards past the tree and I didn’t find it. I didn’t try any 3.3mm full size LDs but with the wind, maybe I should have. The grass on the field was long, probably from the rain delaying the cutting schedule. Also it was rather swampy. Not the best conditions to be testing while weraing my work clothes. Friday it wasn’t raining and the sun was shining. It seemed like a perfect day to test boomerang at lunch. I decided to stick with my plywood ones and not the long distance ones. When I got to the field the wind appeared to be more than I anticpated. I decided to throw anyway. I have a few boomerangs with me that could act as control subjects. The wind gradually picked up as I threw and was gusting around 20mph at times. I still managed to get all the boomerangs tested, many passing, and some put aside for further shaping. Saturday the world returned to normal and it rained, rained and rained some more. Sunday was nicer but cold and windy. I mean really windy, around 30mph. I went in the shop and finish sanded all the boomerang which passed testing. I then did some reshaping on the ones that failed.I would have tested them but was pretty sure even kylies would return in that wind. Next I think I got a little foolish. I set up a piece of plywood on sawhorses, using my shed as a windbreak. 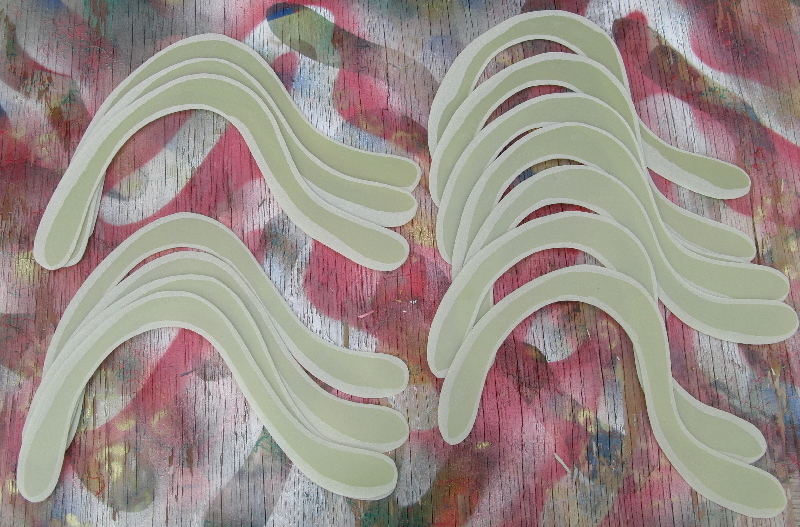 I then proceeded to primer a few of the recently finished boomerangs. Actually I managed to get color on some and some silver spray webbing on them. 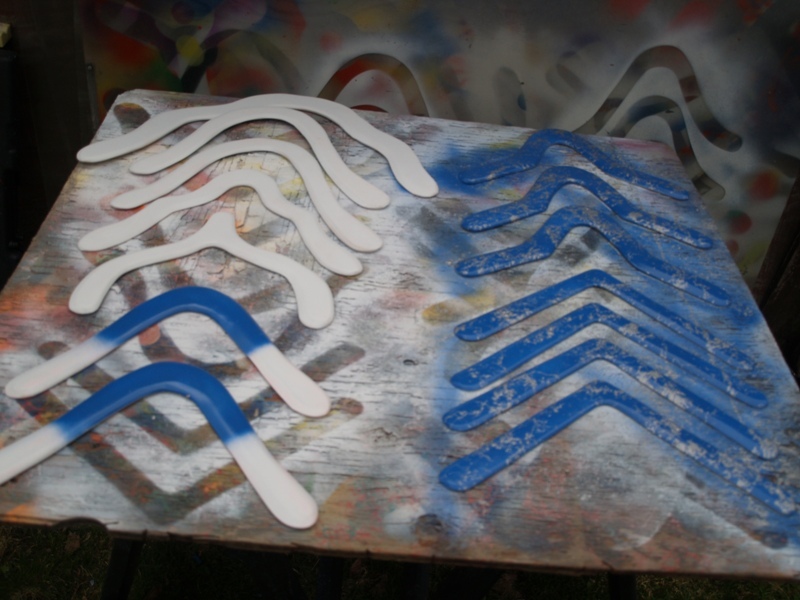 I guess I have seven boomerangs now that require clear finish and seven which need to be painted. I left a few natural as to do different decoration like the patriotic Sycamore copy posted above. I do have a word of caution to my fellow boomerang makers. When it is that windy, don’t paint outside. You will breathe the paint and wear it. I am still trying to get all the tiney specks of paint off my glasses.